Warburton offers a full range of accommodation options from camping at the Caravan Park, or a cabin, to checking in at a holiday house rental or there's a huge range of super comfy B&Bs to suit any budget. YES THERE IS A PLACE TO CAMP!! YES, we know that accomodation in Warburton during this long weekend is rare as Kilian stumbling on a rail trail. … so we have lined up cool camping option that you will love. Warburton Primary School has kindly offered to allow tented camping - at a small fundraising fee per person - on its school oval. A sensational spot within walking distance of the event HQ, it is set in a bowl of mountains, has three playgrounds attached, picnic tables, running water and toilets, a huge sheltered area and they are even talking about putting on a curry night or similar! Remember that the booking system is per night, per person, so please select the option that covers the correct nights you want, and then order multiples of that according to how many people are in your tent. If you want more than one tent site, please register the second / third etc under another name / second registration (you can add at the end of the first process and pay at once). Tents can be any size, but there is no access for vehicles directly (ie. no van or car or caravan camping. cars will park within 100-200 metres of the oval campsite). Please note that there are no showers on site, so you will need to do your cleaning either in the Yarra River post run or head to the Warburton Caravan Park and ask if they will do a fee for shower! More details on the booking site. If you need to alter your existing booking (i.e. add more people) please check in HERE. Images of the site and map site below! For those interested in future year’s events, and want the more fully flush facilities of a holiday park (think showers, toilet blocks, kiosk, cabins, power, vehicle camping), then lock in soonest to the Warburton Holiday Park (see below – the 50km and the lilo derby both run through here). Booked out for 2019, but get in early for 2020! 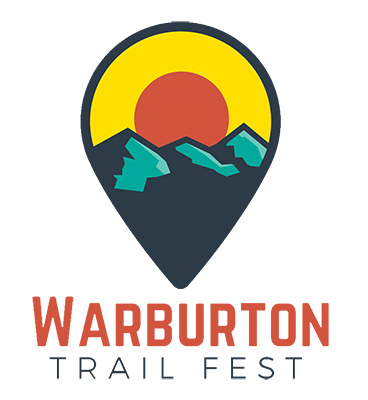 as the Trail Fest is on a long weekend Warburton is already popular with long weekend crowds so gets booked out early!